HoneyBook's raison d'etre is to make the process of booking clients easier for you and easier for them, and the payment process is a huge part of the experience. That's why we offer a several payment options, so you can decide what works best for your business. And since clients are like snowflakes, and no two are quite the same, you can change your payment options on a file-by-file basis. 1. From within your file, click the Gear icon in the top right corner of your screen to open the File Drawer. Allow Gratuity: toggle this on to allow your clients to add a tip to their payments. Enable Payment By: choose whether your clients can pay by credit card, bank transfer, or either. Most members leave both options on, so their clients can decide. Learn more about payment options here. 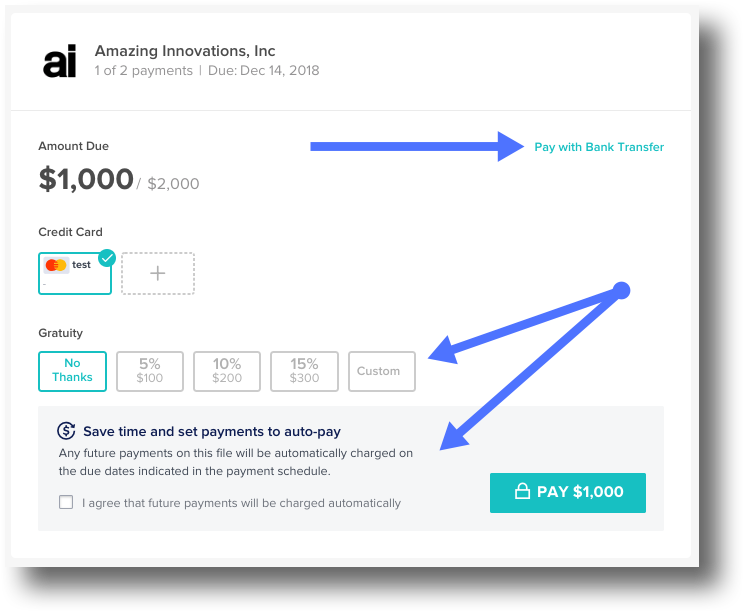 Set to Auto-Pay: set up auto-pay to automatically charge your client on the appropriate due dates. Your client will need to agree to this before auto-pay takes effect. 3. When your client receives the file and proceeds to the payment options, they'll now be able to make their payment using whatever settings you saved. For example, the image below shows the client-side view of payment options that allow both credit card and bank transfer, have turned gratuity on, and have set up auto-pay.